People who laid their bodies on top of others to shield them from gunfire. Others who ran back into the path of bullets to help strangers get out. Concert-goers who carried the wounded on railings and tables as makeshift gurneys and who started up their own private pickup trucks to bring people to hospitals. Sunday night's Las Vegas attack was the worst shooting in modern US history, but the tales of heroism coming out of it showcase some of the best of humanity. Concert-goer Mike McGarry, who survived, told Reuters news agency that he lay on top of his children when the shots rang out. "They're 20, I'm 53. I lived a good life," he said. He said people running over him to get away left shoeprints on the back of his shirt. Similarly, Carly Krieger shielded her young daughter by lying her on the ground and getting on top of her. She told CNN: "Thankfully we were towards the back of everything. There was a seated area back there and quite a few kids back there. "Everybody just started yelling get down so I put the baby on the ground and got on top of her. "Not once did she cry or scream or ask what was going on, so I think she's going to be OK."
Kurt Fowler, a firefighter from Arizona, was shot in the leg when shielding his wife and has needed surgery. He will not be able to return to work for months, reports say. And 29-year-old Sonny Melton, of Tennessee, was fatally shot while helping his wife, Heather. "He grabbed me and started running when I felt him get shot in the back," she told WMV-TV in Nashville. "I want everyone to know what a kind-hearted, loving man he was, but at this point, I can barely breathe." Mike Cronk told ABC News that his friend Rob next to him was shot in the VIP section near the stage, and they stayed together while Rob put fingers in his own wound to stem the bleeding. "He was right next to me, and we heard the gunshots go off. I think everybody thought they were fireworks at first. Then my buddy said: 'Hey, I got hit,'" Mr Cronk said. "It was very chaotic, but my buddy was shot so there was no way I'm gonna leave him. "I know he wouldn't have left me." Later, Mr Cronk and his friend tried to get to a hospital with other victims in a pick-up truck. Roads were closed and they found an ambulance that they transferred the victims in to - but one of them died in Mr Cronk's arms. Robert Hayes, who works as a firefighter in Los Angeles, got his wife and friends out of the venue and promptly identified himself to the Swat team on site. He told Fox News that he had personally pronounced 20 people dead, working with a medic from the local fire department. "It's just something that we do," he said. "I wasn't trying to be a hero." Todd Blyleven, a former minor league baseball player, told the Washington Post that once his group of friends were safe, he went back inside to try and help others get out. The paper says he joined a "group of volunteers" and may have helped remove 30 or 40 people from the gunfire. "I just felt like I had to," he said. "I would hope that if I or my family, was in a situation like that, that someone would come in and get me." Lindsay Lee, a tattoo artist, was one of many who used her truck as an ambulance. In one video on Instagram, a man can be heard telling her: "Right now, we need your truck. We just need to get people to the hospital." She replied: "Okay, go ahead, put them all in the back!" She wrote that one man had died in the truck and her fiancé had carried him into the hospital. "This was a nightmare, I've never run for my life like I did tonight," she continued. 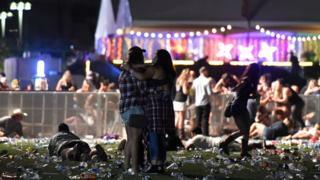 In the early hours of Monday morning, police appealed to people to stay away from Las Vegas Strip even though many wanted to pour in and help. Instead, they asked people to give blood - and hundreds did.